After Albert's Bridge, the composer David Lyon and I wrote Doctor Love . I adapted the libretto from Molière's L'Amour Médecin . I was asked if I had taken liberties; the answer was yes, liberties and egalities and fraternities. I put Molière himself on stage, complaining about the indignities of theatrical life, and introduced Louis XIV into the action. I'd like to think the greatest of French writers would not have disapproved of what I did with his piece, which he had knocked off in five days. 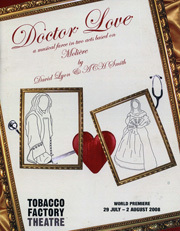 Doctor Love was staged at the Tobacco Factory theatre, Bristol, in 2008. A reviewer described the production as "Commedia dell'arte meets Carry on Camping ." VENDOR approaching, a tray slung around his neck. SCANDRELL I must buy some for her. It's a well-tried standby. This magic box will cure. SCANDRELL Sir, I'll take a box of your specific. CRONIES Sir, he'll take a box of your specific. Measles, or sneezles, irrational fear of weasels. Scabies, or rabies, and things you can get from babies. Mumps, or bumps, or down in the dumps. Diphtheria, hysteria, a rash on your posterior. With what this box is worth. SCANDRELL Sir, I believe every word you say. Nothing begins to pay you adequately, but here's a sou. Will that do? CRONIES (slowly and conspiratorially): Doctor Patrick's Prophylactics! ALL (in tempo, triumphant) Doctor Patrick's Prophylactics! VENDOR Contusions, confusions, premature conclusions. Shingles, and tingles following a flingles. Aches and pains, migraines, balding heads, chilblains. Pox, and shocks, and ill-matching socks. Flushes, blushes, indifference to thrushes. Winter chills, unpaid bills, dull quadrilles, blunted quills, illicit thrills. CRONIES With what this box is worth. VENDOR This magic box is worth. CRONIES This magic box is worth. CRONIES have been dancing around him to express their satisfaction. They begin to exit, with VENDOR. VENDOR (song fading) Doctor Patrick's Prophylactics! Cost (including postage): UK £6.50 / Europe €8 / USA $12.10. Cheques made out to Falling Wall Press.